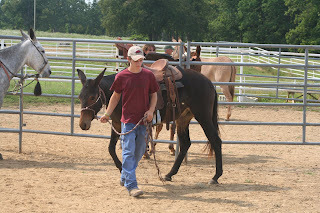 Our friend, Joe Bufalo, hosted a Brad Cameron Mule Clinic this weekend. Joe asked Cole to take one of his colts for the colt starting clinic. 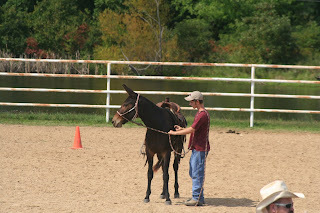 Cole has started a few colts already and took to Cameron's methods very quickly. There were 2 other colts the first day and 3 other colts on the second day. There were many people watching. The weather was perfect!